As it turns out, "where no man has gone before" may be an exaggeration judging by Cryptic's response to the popularity Star Trek Online open beta test. Even though it was one of the few once-popular fictional universes that had yet to be transformed into an MMOG, many were skeptical about Cryptic Studio's Star Trek Online. "Star Trek isn't relevant anymore," claimed the naysayers. "The only people who will want to beam up and go to maximum warp are the ones dressing their kids as Klingons to go to conventions that smell slightly of cheddar cheese." Perhaps, but then again... perhaps the franchise has more popularity lingering under the hood than people expected (and last year's successful franchise semi-reboot didn't hurt, either) - at least if we can take Cryptic's word on the matter. "Reality has exceeded even our wildest expectations," said the developer in a "State of the Game" post on the official website. The popularity of the game's open beta has been something the developers had not been prepared for, mentally or technologically (judging by the servers, anyway). Where the heck did you all come from!?! Reality has exceeded even our wildest expectations. We looked at numbers from Closed Beta, numbers from games we've worked on in the past, and some numbers that float around the games industry. Based on those numbers, we predicted that about 65% of the keys we generated would eventually turn into active players (some keys never get delivered, others are lost in spam boxes, some are never redeemed, etc.). And, we predicted about 1/6 of those redeemed keys would turn into players that game at the same time. It's what we call our concurrent users or CCU, for short. The actual numbers crushed our predictions. So, we tore apart our logs and began doing a lot of extra optimization work even while we stumbled upon some truly bizarre crashes that can only appear with this sort of load. The result? The shard has been steadily improving over the first few days of Open Beta. Given the hardware we're adding and a couple more fixes we have in the pipe, shard performance and stability should continue to improve over the coming week. Good for Cryptic - it's always heartening to read about developers doing better than expected especially in an economy like this - but the real question is this: Will all the people stick around once the free trial is over and they have to pay? That remains to be seen, as the game gears up for its February launch. 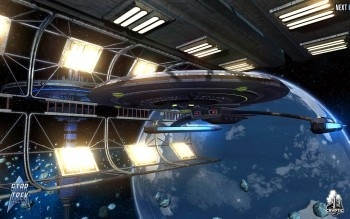 Escapist editor Greg Tito is in the STO beta as we speak, so stay tuned for his thoughts on the game later this week.